Watching the same YouTube video again and again on your mobile will eat more internet data. So why not to save videos offline that we are going to watch more than once which will also save our internet data. Here you will find 10 Best Youtube Downloader which works on Android, iOS, Mac, & PC as well. YouTube is one of the fabulous platforms to watch videos, but the only disadvantage is we cannot download videos. Though we can save videos as offline on Android & iOS. But to download videos as a media file which can be transferred from one device to another device, we need to use any youtube downloader. You can try any of the listed YouTube Downloader on your device. By using these downloaders you can also download videos from IGTV (Instagram). The best free Entertaining platform for watching videos & listening songs online is obviously YouTube, so make sure to download your favorite videos offline with best youtube video downloader. If you are a movie lover than I suggest to download movies from websites. Because on YouTube it is hard to find new and full-length Movies in HD. If you still want to watch on YouTube the best method is to directly search on youtube. Here is the list of 10 Best YouTube Downloader for Android, iPhone, Mac, & PC. IDM the most used download manager for downloading the videos in different qualities (4K, 1080P HD, 720P HD, 480P, etc). It is one of my personal methods to download videos from YouTube. Downloading Videos with IDM gives an advantage which is fast downloading. We can easily download any video through IDM using services like online video downloader. Sometimes, we can’t able to watch 4K videos because of low internet speed, then this one is the perfect method for you. So, download 4K videos now from YouTube with the help of Internet Download Manager. Check how to add IDM on chrome or other browsers. aTube Downloader is also the popular video downloader for the windows users. This software has all the features of IDM. But this also has some additional features like Convert Videos to MP3, Resize the video size, video converter, screen capture, and a lot more. One of the major features of aTube downloader is you can able to record the screen. You can download videos from websites like Vimeo, Facebook, Dailymotion, Metacafe, Yahoo!, Twitter, etc. If you like the features of this download manager check it out. If you don’t have IDM or you don’t want to install it then this method is only for you. You can download videos from any sites like YouTube, Facebook, Instagram, Hotstar, Voot, TVF and more for free at high speed. It provides the highest possible speed to the user for downloading or streaming the videos. 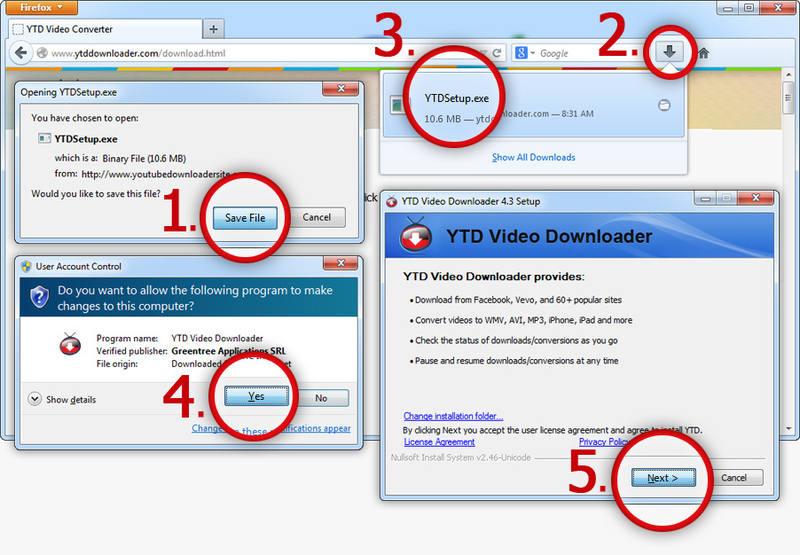 To use it, you just need to copy the video link and paste it into the YTD Video Downloader. The YTD Video Downloader will work on your Windows 10/8.1/8/7. The fastest way to download YouTube videos is Y2Mate. It helps you to download the video in any format or qualities like 1080P. It is one of the amazing youtube downloaders that I have used and also it is very easy to use. The best thing I like about Y2Mate is, we can download videos easily. You just need to insert “pp” after the word “youtube” in the link to download videos. Yes, just add “pp” in the link for downloading the videos, then select the format in which you want to download & in last choose the save location. That’s it. If you can’t able to use the download manager on your PC, you need to try Online Video Converter. We can download the video in any format and in any quality. This will help you to download the videos from YouTube(obviously), Instagram, Dailymotion, Vimeo, and more. With the help of Online Video Converter, you can also download the video in Audio formats, like, MP3, AAC, OGG, M4A, WAV, etc. Just enter the URL and start downloading the video with help of any browser. If you’re looking for mp3 downloader check it out now. Note: The Online Video Converter & Y2Mate also work on PC. The only and the best ever third-party application available for the android users to enjoy the videos offline. Videoder allows to download videos from Youtube, Facebook, Instagram, Hotstar, Voot, TVF, SonyLiv, Dailymotion, Vimeo, Twitter, Vine, and many other video Platforms. It is easy to use, just copy the link of the video page and paste on the Videoder App, then a download button will appear, click on it and select quality. That’s it, now the downloading will start. It is a very useful app for Android phones. The first and one of the traditional app to download the YouTube videos offline is done by TubeMate. It has the great collection of websites from where we can download the videos. It also helps you to download in any quality or in any format, like MP4, AVI, or MP3 as well. You just need to copy a link from Facebook, Twitter, Instagram, youtube and search on TubeMate and tap on download icon. You can also download the full playlists with the help of TubeMate free APK. This is one of the best youtube downloaders for android. If you’re able to download the videos offline make sure to share this article with your friends. YouTube Go is the lighter version of YouTube app and you can also able to download the videos offline with help of this app. Last year, Google introduced its Android Oreo Go project, and now its available on phones like Nokia 1, Lava Z50, & Micromax Bharat 1. Android Oreo Go (Edition) has integrated data saver for saving the data capacity on smartphones. So, If you are using the low-end specifications device you need to try the YouTube Go app on it for offline downloading. It is one of the best options to download videos on iPhone. This app helps you to manage the videos and also helps you to transfer the videos or files from one iPhone to another one. This app is fully secured because this app needs a password to download or access the videos. For downloading, you just need to open any website like YouTube then search for the video you want to download. That’s it. Love it? Share now with your friends. Another alternative to my download manager & file transfer, so you can also download the videos on your iPhone or iPhone X with help of this app. This app also helps you to stream live on platforms like PS4, SmartTV, and Xbox etc. Ultra Downloader Plus app downloads the videos in high resolution like 4K, 1080P, 720P, 480P, etc. The process of downloading the video is same copy the video link and download it. The app is fully secured so without any worries start watching your favorite videos offline. You have just read Best YouTube Downloader for Android, iOS, PC, and Mac. Here is our last point on this topic that if you are an Android user then definitely go for Videoder App. And if you are PC or Windows user you can opt for IDM. For Mac, you can use Online Video Converter. So this was our view on the Best YouTube Downloader that you can use.